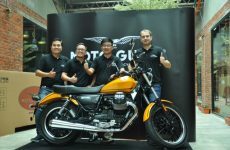 conjunction with NAZA Merdeka Autofair 2017 in August, Next Bike Sdn Bhd; the sole importer and distributor of Ducati in Malaysia, launches the MY Ducati Adventure Series (MYDAS) with the inaugural “Campout with the Multistrada 950”, for local motoring media. locally”, said Naza World Group of Companies, Group Executive Chairman, Datuk Wira SM Faisal Tan Sri SM Nasimuddin. “The new Multistrada 950 is made for those who seek comfort and style and offers superior performance with an incredible riding ease – ideal for those who dream of riding a Ducati. It is perfect for urban daily commuting and extremely low ownership costs with the longest service intervals in the segment”. The two-days, one-night ‘Campout with the Multistrada 950’, organized along with Big Boys Adventure who are seasoned in touring programs; covers 300 kilometers of pure riding, flagging off from Ducati Malaysia Headquarters at Naza PJ with marshalls leading the convoy through the sweeping roads of Genting Highland and putting up at Caravan Serai in Bentong for the night. 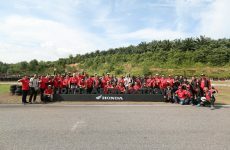 On Day Two, participants will get to further experience the versatile capabilities of the Multistrada 950 with a hill climb up Fraser’s Hill and a stopover at Sungai Pertak for a picnic session by the riverbank before heading pass Kerling on the way back to Naza. preventions including re-enactment of emergency scenarios were also part of the program. With Malaysia entering the monsoon season, Givi Malaysia partnered with Ducati Malaysia in an all-Italian connection to offer all riders weatherproof gear that helped participants stay dry and focused on riding without worrying too much of the elements. The new Multistrada 950 combines the kind of riding excitement that only a Ducati can offer with extraordinary versatility, making it the ideal bike for all types of use, at any time of day. It is designed to put great performance within everyone’s grasp, especially for those who want to get in some touring (and perhaps enjoy the company of a passenger) and those who want an agile fun bike that’s ideal for everyday use, synonymous with the tagline, My First. My Last. My Everything. Utilizing the Multistrada family’s trademark design and chassis geometry, the Multistrada 950 is lighter than the Multistrada 1200 and with a seat height of 840 mm, it sharpens the excellent dynamic performance. The 19″ light alloy front wheel ensures comfort and fun on any road surface, asphalted or not. Suspension with a generous 170 mm of travel and a twin-sided swingarm keep comfort levels high while giving the Multistrada 950 outstanding agility. Moreover, the 20-litre tank puts plenty of miles between refueling stops. WTR-World Tour Rider shared a post.